Most of the pure pick swaps between clubs occur late in the trade period with an eye to draft positioning. Clubs have considerations such as the quantity vs quality of usable selections, matching bids for tied academy and father sun players, and how many draft picks they actually want to use. This year, with pick trading right up to draft night, we might not see the same flurry of pick swaps next week. This trade occurring relatively early in the trade period strongly suggests either Brisbane or Gold Coast may well have done this swap with a view to an upcoming trade instead. 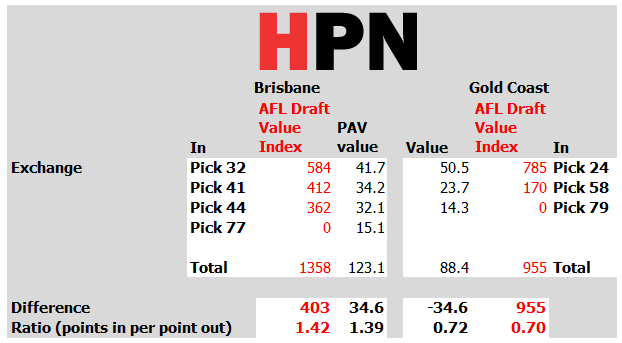 Notionally, Brisbane do much better out of this swap, which looks pretty similar in both HPN Draft Pick Value Chart (using PAVs) yield and AFL Draft Value Index terms. It’s a 3 for 2 swap of usable picks and Pick 24 is just not nearly high enough to make up for this. Brisbane may have a bid coming for Connor McFadyen as early as the first round so the split of picks, increasing the matching value, while dropping down the order makes sense for them. For Gold Coast, they had five selections coming before pick 41, so we can reasonably assume they weren’t planning on taking this many selections to the draft. They’ve managed to insert pick 24 as their 4th selection, which is a good hand to hold in a strong draft year. The lost value is something they were perhaps unlikely to access in the first place, but surely they could surely have done better in the exchange than this. Both clubs still have irons in the fire as far as rumoured trades go, so it remains to be seen how this swap fits into their broader trading strategy. Verdict: Unfair trade, weighted towards Brisbane.